The Blue Bird BMS-101AMG is a tiny metal gear servo from Blue Bird wih an analogue amplifier, as preferred by some for lower current draw and the relaibility that comes from using well proven technology. This servo is strong, powerful and has a very tight geartrain with little or no free play. Featuring low weight, a 7.6 mm thin case and one kg-cm or torque this is an excellent servo for DLG / HLG / F3K / F3P / 3D EP RC models. 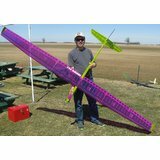 The 7.6 mm body thinness ensures the Blue Bird BMS-101AMG will fit in very thin wings, making it a great servo for 1m discus launched gliders and small slope soarers. 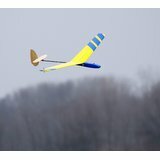 Its light weight, high speed and great precision makes it well suited for F3P and other small aerobatic/3D indoor and outdoor RC models. The BB BMS101 AMG is supplied with four output arms, mounting screws, optional mounting tape, and a fun sticker set. The large arm is 5 cm diameter (2.5 cm largest hole radius) making it excellent for F3P aileron control. The Blue Bird BMS10AMG is in many ways similar to the Ripmax SD100, and is a good alternative to this servo for those using NiMH batteries or 1S LiPo batteries. Its main benefits over the SD100 and the Dymond D47 are its metal geartrain giving it greater toughness. 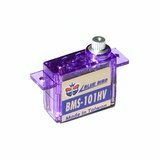 For applications a 2S LiPo battery we recommend the HV version of this servo: Blue Bird BMS-101HV. Also see the disgital version of this servo, the Blue Bird BMS-101DMG. 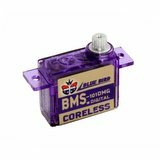 We're pleased you would like to review Blue Bird BMS-101AMG Servo - 1Kg.cm 0.07s 4.5g 7.6mm. I ordered those for a Vladimir ELF build, and so far - after about 10 hours of flying in freezing weather conditions - they've performed flawlessly. The choice of the analogue, non-HV version of this servo was deliberate, as I'm running the ELF electronics directly / unregulated from a small 250mAh 1S LIPO. That's pretty efficient, especially considering the low temperatures. I bought six in total so far, but one was defective. Although the operation with no load was good, I was bogged down by the torque of the torsion bar. 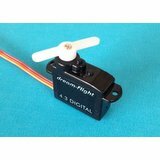 Blue Bird 101 * - excellent servo, especially for small DLG! The Bluebird 101amg servos I ordered from Neil arrived safely and well packaged. These servos are EXTREMELY small and light weight. I haven't powered them up yet but they look like they are just the ticket for my HK V2 DLG aileron position. I can't wait to see how they work. NICE PRODUCT!